The photo above is a touchingly sorrowful account of what anticipation can do to a child. 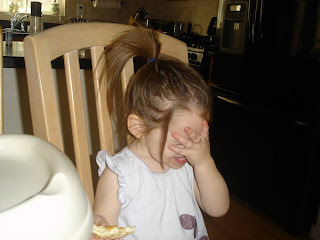 My poor daughter sits in near despair over the "Favorite Cheese" poll on this blog. She is waiting in suspense for the results.....but aren't we all? There are only eight hours left, people. Which will it be? Parmiggiano? Romano? I know you are all biting your nails, but let not your hearts be troubled......The best cheese will win, and we will announce it tomorrow, with a special recipe showcasing the winner. Stay tuned!